This autumn we cut down some standing dead sumac trees in our woods. The trunks were about 60 cms. In diameter and the well-dried wood will make excellent firewood. When I think of burning this wood I think of the Buddhist ceremonies in which a roaring fire is made of carefully piled sticks of sumac wood while monks chant in deep, sonorous voices. The tree is associated with Umayado no Miko, more commonly known as Prince Shotoku (AD 574 to 622) who is supposed to have cut a sumac and from its trunk carved four guardian kings, the Shitenno, and vowed to build a pagoda temple and to promote Buddhism if his army won a victory – but to go on about that would take several pages! In the winter branches of these ‘nurude’ trees, with their dense red cluster of little fruits or ‘drupes’ are brought into Japanese homes as good luck decorations. This sumac is also known as the Japanese lacquer tree, because if cut the bark exudes a toxic sap containing urushinol, used as a lacquer. 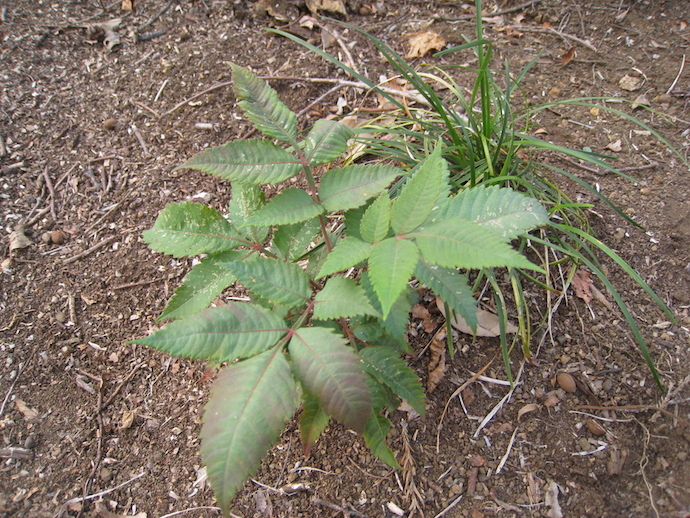 There are about 35 species of the sumac tree growing in temperate and subtropical regions all over the world but especially in East Asia, Africa and North America. It is an amazing tree, linked to so much history and folklore that I could write a whole book about it. In our woods it grows about 10 metres tall, but in some places it can reach 20 metres. It is not a big tree, and in some areas it is small enough to be considered a shrub. 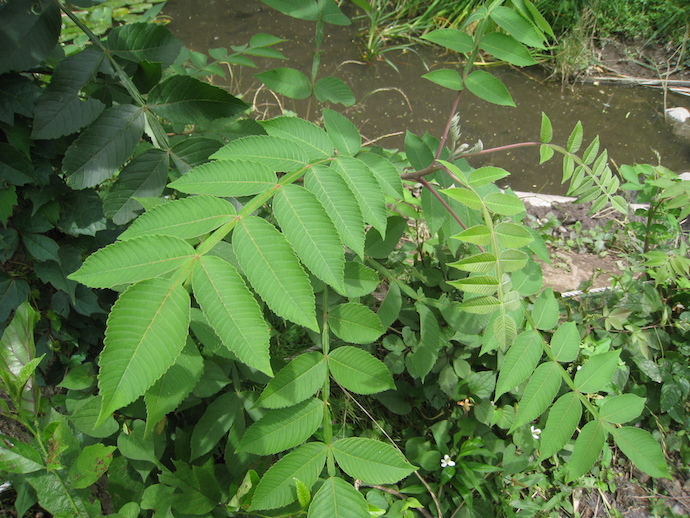 It has large leaves with 7 to 19 leaflets. The tiny, greenish, creamy white flowers grow in dense spiky clusters. Birds spread the seeds, but this tree also grows new green shoots or rhizomes from its roots. In the Middle East especially dried and powdered sumac fruits are used as a red, tangy, slightly lemony spice in all kinds of cookery. I myself use this spice that my older daughter Miwako sends to me from British Columbia where it is gathered, dried and powdered by coastal native folk to flavor traditional native dishes. Sumac spice is great with fish, chicken, duck, or mixed with olive oil and a little salt to flavor salads and other vegetable dishes. In some areas the seeds make wax for candles. Native Americans brew a refreshing beverage, sometimes called ‘sumacade’ by soaking the fruits in cold water. They also smoke the dried leaves in their ceremonial peace pipes. Sumac fruits, nuts and leaves have long been used in traditional medicine throughout Asia and the Middle East, and it was also used as a dye. If Prince Shotoku used it to carve sumac wood then I’m sure that so did others, and the wood probably has many uses once you dry it and deal with the tendency to cause rashes.